G’day from Sydney, Australia’s most populous city and one of the most visited destinations in the world. Despite being a bit jet-lagged from a full day of travel from Tokyo, members of IU’s delegation spent several hours here on Friday setting the stage for the second leg of what has already been a busy, enlightening and productive trip. 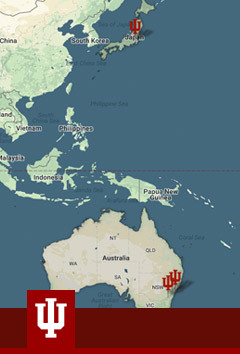 Much like Japan, Australia serves as a major focal point for IU’s international efforts, reflecting the country’s size and strategic location, history and culture, diversity, dynamic economy and major two-way investment relationship with the U.S. To the latter point, more than 1,200 Australian firms have operations in the U.S., 12 percent of which have assets or income greater than $20 million. From left: Simon Jackman, CEO of the United States Studies Centre at the University of Sydney, IU President Michael A. McRobbie and Mark Baillie, chairman of the center. In recent years Australia has become an increasingly popular destination for IU students seeking an overseas study experience. Currently, about 150 students study abroad here – more than any other Big Ten university – and that total has risen by over 50 percent in just the past three years alone. At the same time, the university continues to open its doors each year to about 25 students from Australia, as well as a half dozen visiting scholars. On Monday in Australia’s capital city, Canberra, IU President Michael A. McRobbie will formally extend IU’s longstanding partnership with the Australian National University, the country’s premier university. The partnership has generated exchanges of faculty, students and staff and supported collaborative research and scholarship led by the ANU-IU Pan-Asia Institute. Launched in 2009 and based in IU’s School of Global and International Studies, the institute is one of IU’s most active international collaborations, and its work covers a broad range of issues related to Asia. McRobbie will also co-chair, along with ANU President Brian Schmidt, a summit meeting featuring faculty from both institutions who will discuss their work in, among other important areas, art and design, business, cybersecurity, law, linguistics, public affairs and public health. A brief stop in Sydney would take McRobbie and his fellow delegation members to the United States Studies Centre at the University of Sydney. McRobbie serves on the advisory council for the government-funded center, which seeks to provide Australians with a deep and balanced understanding of the U.S. through teaching, research and public engagement. Now in its 11th year of existence, the center also provides support for scholarly exchanges between Australia and the U.S. In 2015, the center helped bring award-winning Australian poet Kate Lilley to IU’s Bloomington campus as the first recipient of the United States Studies Centre-Indiana University Creative Arts Fellowship. The fellowship was made possible by a gift from former Australian Ambassador to the U.S. Michael Thawley, who received IU’s prestigious Thomas Hart Benton Mural Medallion in 2002. 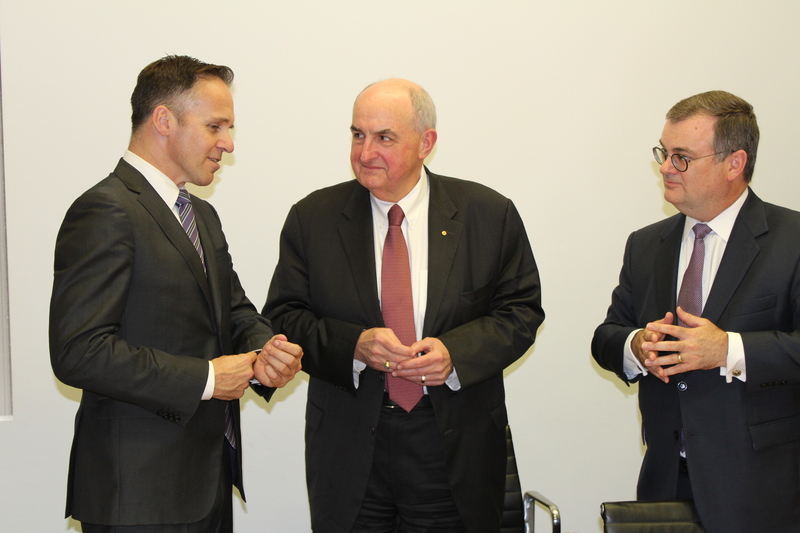 While at the center, McRobbie and IU Vice President David Zaret talked about the breadth and depth of IU’s relationship with Australia and the university’s desire to expand upon its research and scholarship on contemporary Australian politics and culture. For their part, center officials expressed their appreciation for IU’s international engagement, while also suggesting that Australia’s government and educational institutions would benefit from learning more about IU’s and Indiana’s advancements in the life sciences, information technology and business innovation, all areas relevant to the center’s work to better understand Australia’s rapidly-evolving economy and its relationship with U.S. investment. Finally, as day receded into evening over stunning Sydney Harbour, the IU delegation met with a number of Australian alumni eager to swap stories and reconnect with their alma mater. Their energy and excitement about IU, the progress being made across the university and IU’s increasing engagement in Australia truly were infectious and made for an energetic start to what promises to be an exciting couple of days down under. 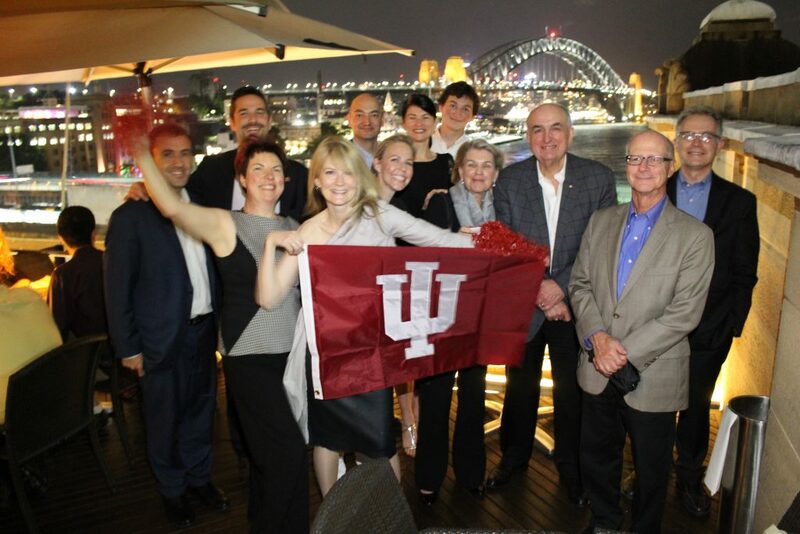 Members of IU’s Australia alumni chapter with the IU delegation in Sydney.